HomeOPTIFOAM AG SILVER WOUND DRESSING 4X4"
Optifoam Antimicrobial Adhesive Dressings DRESSING, OPTIFOAM® ADHESIVE AG, 4"X 4" 10/BOX For wounds with intact periwound skin. Ionic silver provides antimicrobial barrier1 Continuous antimicrobial protection1 Highly absorbent1 Conformable1 Can manage repeated bacteria introduction Non-staining Moisture vapor transmission rate (MVTR) adjusts to fluid level Waterproof outer layer Indications: pressure ulcers, diabetic foot ulcers, diabetic foot ulcers, donor sites, lacerations and abrasions, skin tears, first and second-degree burns and under compression bandages. Contraindications: third-degree burns,lesions with active vasculitis, individuals with a known sensitivity to silver. May be left in place for up to 7 days; Dressing change frequency will depend on amount of drainage. FREE SHIPPING! For wounds with intact periwound skin. Indications: pressure ulcers, diabetic foot ulcers, diabetic foot ulcers, donor sites, lacerations and abrasions, skin tears, first and second-degree burns and under compression bandages. Contraindications: third-degree burns,lesions with active vasculitis, individuals with a known sensitivity to silver. 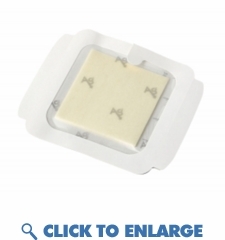 Dressing Pad Size	2.5" x 2.5"
Product Name: OPTIFOAM AG SILVER WOUND DRESSING 4X4"